The November meeting was held at Jack Putnam's shop with 10 members in attendance. Jack held a short meeting in the absence of President Dave Benny. Dave's daughter Susan was struck down in her prime by an unforeseen condition. Our club is saddened by this tragedy and offer Dave and Janet our heart felt sympathy. Diamond River Steakhouse in Findlay has been picked as the spot for the annual Christmas Party. The restaurant is located across from Meijers on the south side of US 224 between Ruby Tuesdays and the Family Dollar Store. We will be eating at 6:30 pm and everyone is invited to congregate in the lounge between 6:00 and 6:30 for refreshments. PLEASE CONTACT JACK AT (419) 358-6313 OR e-mail AT jputnam@wcoil.com TO MAKE RESERVATIONS. He will need to know how many people to expect for supper; so, he can make reservations. The rest of the meeting consisted of a handout of a copy of the bylaws. Jim will make sure that they are copied onto the website so that they are more readily available. Once again, we would like the MTFCA membership number of everyone in the club that is a member of the Model T Ford Club of America. We keep track of these numbers for the national organization, to make sure that we are in compliance with our charter. If you get the "Vintage Ford", the number will be on your mailing label. If you're not a member, ask one of the officers about the benefits of membership. After the meeting was adjourned, we had a short meeting about the 2002 All Ohio Jamboree. The host Ramada Inn has been contracted, preliminary artwork has been submitted, catering has been obtained, and the national organizations' magazines have been notified. We still need people to sign up to help pull this thing off. We'll need everyone's help to keep everything running smoothly. Once the Jamboree committee was finished bending everyone's ear, we all had a chance to take a look at Bill's 1923 wood job. 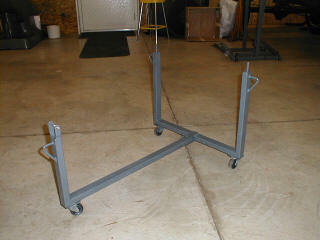 This thing has been sitting at Jack's for quite a while, as the wood kit required a lot of modifications to fit. The final top rail had to be cut from a sapling in the side yard. A group of ready-to-fit rods was also on display to show the difference in weight between different styles and manufacturers. Please welcome the club's newest member, Tyler. Here we see Tyler enjoying another fun filled T meeting with his dad, Kurt. 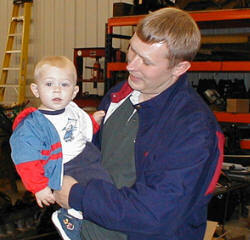 Tyler lives with his mom and dad in Lima, Ohio. His interests include drooling, testing sneakers for the Nike Corporation, and watching mom and dad search for those keys that he's hidden under the couch cushion. You can see by the gleam in Tyler's eye that he's destined for a shiny Model T roadster. Your $20 keeps the club afloat with postage stamps, paper, refreshments, and a consistent meeting place. Club membership is the ingredient that makes the difference between a project car and a touring car. The editor would like to remind everyone that this is free space provided for your benefit. 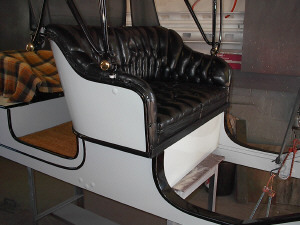 If you have something to sell or need anything pertaining to Model T's let us know. 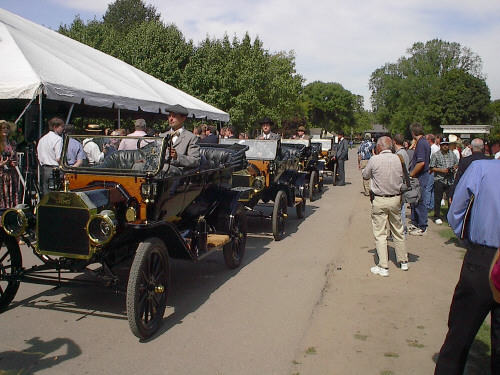 All Ohio Model T Jamboree - September 6th - 8th 2002. 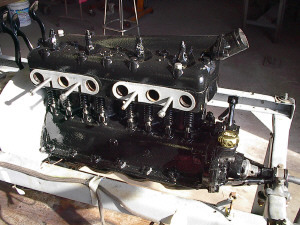 This 1923 body took a lot longer than expected. We learned that not all precut kits are created equal. This may have something to do with the fact that not all 1923 bodies were created equal. 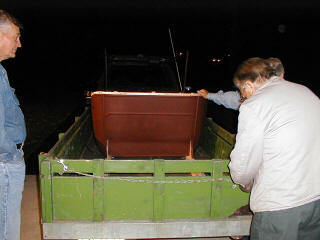 The body is moved onto Bill's trailer by willing club members and sent out into the night. The native lumber top rail can be seen against the night sky. This is a set of ready-to-fit rods that are laid out to show the variation in weight and size of the different manufacturers of these parts. Much like the body parts for the 1923 mentioned above, not all rods are created equal. This is where working with a lot of rods has its advantages. Mismatched rods can cause vibration in an engine which, in turn can cause cracking of the crankshaft. 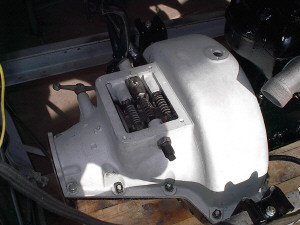 By using rods that are close to the same weight, engine vibration is kept to a minimum. 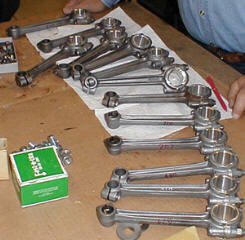 Once the rods are matched with thier closest brothers, they are wired together for use in a future engine rebuild. 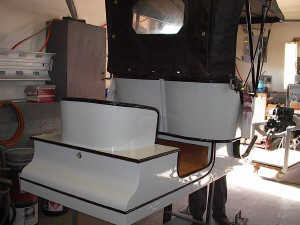 I just had to put a couple more of the T100 project pictures out for everyone to see. 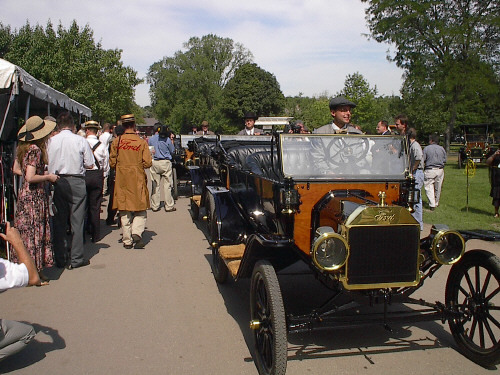 These are the first four cars as they were presented to the dignitaries and guests at the Greenfield Village T100 dedication before the 2001 Old Car Show weekend. Both of the pictures are from Jack Putnam's collection. 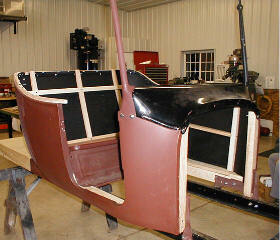 Here are some shots of the progress of Richard Briggs' 1909 Model T. The work is being done in the shop of Bill Sieberg. The work thus far is well above excellent! We try not to praise Bill too much; but, sometimes he just plain outdoes himself. This will be a fine show car as well as a great running machine. I hope to get the finished pictures in a couple of months. Stay tuned.